In these days of intense competition, it’s vital to utilize every opportunity to promote your brand and increase your visibility. While you might have a solid digital marketing campaign already in place, it doesn’t hurt to use old-school but effective techniques and tools to promote your brand. One of the best ways to do that is to distribute promotional mugs to your business associates, friends, and relatives. They are custom printed mugs that have your brand name, tagline, or logo on them. You can print anything you want on them, based on what you want to promote. Companies have used such promotional mugs as a part of their marketing campaign for decades now and many still consider it a viable strategy that delivers good results. It Will Be Used – Coffee mugs are useful items and most people won’t discard it, even if it has a different company logo on it. They’ll use it to consume coffee, as a pen stand, or even pass them on to a friend or family member. Promotional mugs are useful and people rarely toss them away like other promotional items. Influence – Because these mugs will be actively used, they have a mild influence on their owners and the people around them. Your logo or tagline would make them curious and they might research your brand or open a discussion about your company with the owner of the mug. Very few promotional products or advertising campaigns have this ability to influence people or increase curiosity. Longevity – Coffee mugs are very durable and don’t crack or chip easily. Unless someone drops them or breaks them, the mugs will be around for years and continue influencing people for years. No other marketing strategy has this level of longevity and that makes it worth the investment. Flexibility – As we mentioned before, you can print anything you want on the mug so you can use it to promote your business, event, particular product, charity, etc. You can even use them in political campaigns where visibility and branding is important. Promotional mugs are a great, inexpensive way to market your business and they are very useful as well. They won’t strain your marketing budget because they’re a one-time expense. 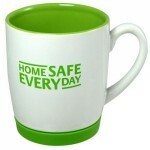 If you want to give our promotional mugs a try, you can easily place an order with us at Ezy Mugs. We’re an Australian-owned and operated company that can deliver products to any corner of the country if you order a minimum of 36 pieces. Have any questions and comments? Feel free to contact us through our website or give us a call on 1300 753 675. We’ll be happy to help you in any way possible.